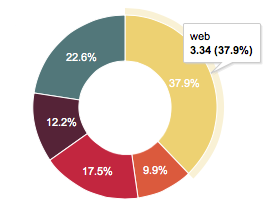 Quick tech tip for today, how to create HTML donut charts like the one below and use Apache Web Server on Mac OSX. Hats off to the BI Happy Blog and Coolest Guy on the Planet Tech blog. I wanted to quickly generate some mockup donut charts by using HTML – and being lazy, figured I would just borrow some code. For starters, I needed to get Apache Web server started on my Mac OSX Mountain Lion – fortunately, the instructions are already provided – so here’s the link: Install and configure Apache, MySQL, PHP and phpMyAdmin on OSX 10.8 Mountain Lion. I have modified the code slightly so it can be run locally on my Mac OSX Mountain Lion web server – below is my version of it for your usage. Thank you so much Denny!!! great help.